Located in the foothills of the southwestern base of the Sangre de Cristo Mountains, the Southeast Foothills area in New Mexico is a wonderful place to live. Available properties in the Southeast Foothills include single-family homes, estates, and condos. Furthermore, there is a wide variety of style and sizes among the real estate options, so you are certain to find something that suits your preferences and budget. Equestrian properties are also available. Homes for sale in the Southeast Foothills are ready to impress you, so now is the time to consider what it would be like to live in this area. As a resident of this area, beautiful scenery will surround you. If you enjoy spending time outdoors, then you will appreciate the ample opportunities to soak in the sunshine in nearby parks and natural areas. For example, the Santa Fe National Forest will always have something new for you to discover. Invigorating hikes and delicious picnic lunches with outstanding views can become part of your everyday life when you choose to live in this area. When you are ready for a more metropolitan adventure, you will have easy access to everything that vibrant Santa Fe has to offer. This city is known as an arts hub and also boasts a rich heritage and culture. Regardless of your interests, you will discover enjoyable activities in this city. For example, you may choose to explore the interesting International Folk Art Market, tour the Georgia O’Keeffe Museum, or watch an enthralling live performance at the Santa Fe Opera. No matter where your adventures lead you, you will be happy to think of your fabulous single-family home, estate, or condo in the Southeast Foothills awaiting your return. An unparalleled location, striking natural beauty, and fantastic residences are only a small sampling of what you will enjoy about living in this area. Splendid homes for sale in the Southeast Foothills are ready to pique your interest, and you are sure to find something that suits your style. 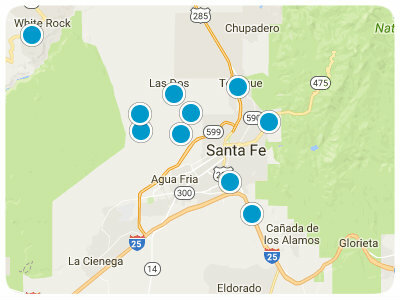 If you are ready for more information regarding Southeast Foothills, Santa Fe, real estate options, please do not hesitate to contact us.